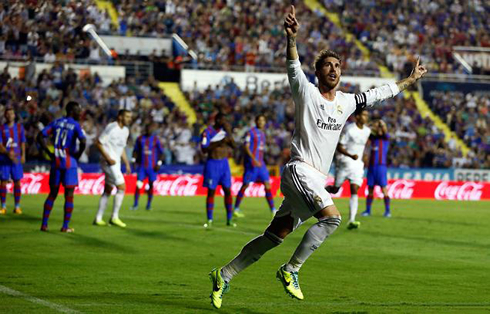 Real Madrid pulled off a miraculous 2-3 win against Levante this Saturday night, after a thrilling ending that surely few people could still believe in. A last-minute goal from Cristiano Ronaldo delivered the win to the visitors and will allow Real Madrid to keep the pressure on both Barcelona and Atletico Madrid at the top of the Spanish league. Cristiano Ronaldo wrapped up the 3 points for Real Madrid last night against Levante, after scoring a memorable winner already deep inside injury time. The Merengues were losing 2-1 in the 89th minute of the game, but an equaliser from Alvaro Morata and a last-breath goal from Ronaldo rescued Real Madrid from another negative result in La Liga. Even though Ancelotti's men came off this match with the 3 points in the bag, the team's performance was once again quite disappointing and left some worrying signs for the future. If Real Madrid wants to be taken serious when it comes to contend for both domestic and European titles this season, they sure have a lot to improve in the months ahead. 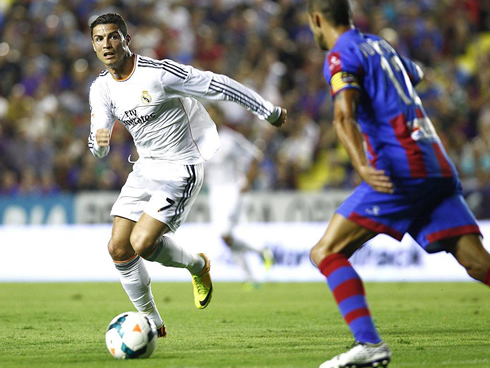 This game against Levante was Real Madrid's last fixture before the international break for the 2014 World Cup qualifiers. Winning it was a must and any other result could have had catastrophic consequences as it would allow both Barcelona and Atletico Madrid to open an 8-point difference above the Merengues. With that in mind, one would certainly expect that Madrid would step on to Levante's pitch with straight intentions of subjugate their opponent and take an early lead. That's not what happened though and what we ended up seeing was Carlo Ancelotti's men struggling more than they should against a team who were always very compact and organized in defense. After a goalless first-half, Real Madrid knew it could be vital to score a goal as early as possible in order to avoid that Levante could earn a significant boost in their motivation levels as the game would drag to its end. Ancelotti ordered his team to move up on the field but ended up being surprised in a counter-attack just 12 minutes after the break. Levante's midfielder Xumetra made a terrific assist for his teammate Papa Babacar and the Senegalese forward struck the ball past Diego López to put the home side surprisingly in front. 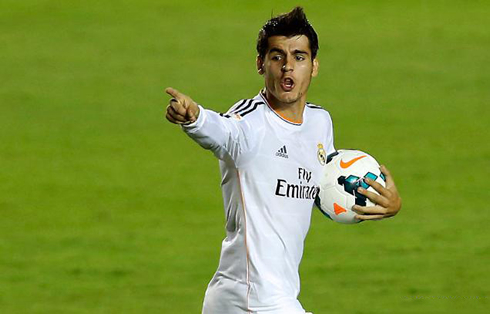 The reaction came right after though, in a corner-kick taken by Angel Di María on the right side of the attack. 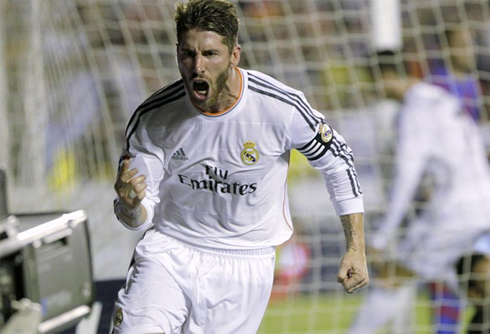 The Argentinian curled the ball deep into the far post and when everyone thought there would be no danger coming in from this set-piece, Sergio Ramos came like a bolt from behind and kicked the ball in the air with his right foot, putting things square in the "Ciutat de Valencia" stadium. The former Sevilla player was wearing the Merengues armband and rightfully showed his teammates what tone they had to put in the game for the remaining minutes. Levante managed to held Real Madrid's attacking intents after the equaliser and they even got to capitalize on the visitors' poor defending once more. The 2-1 took place in the 86th minute, in a play where the former Liverpool winger El Zhar picked up a rebound from his own shot stopped by Diego López and immediately held Sergio Ramos on his back for a few seconds while protecting the ball. The Morrocan player managed to turn around and find the space he needed to finish it off, this time without any chance for the Merengues goalkeeper to save it. 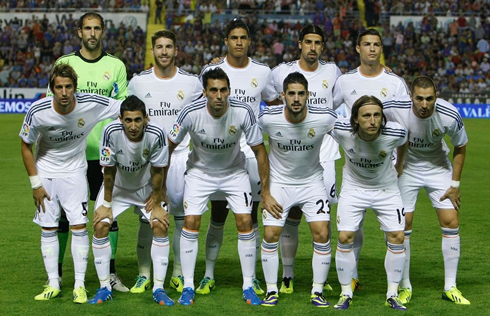 At that time, it seemed like there was no turning around for Real Madrid anymore. Ancelotti had already played all his cards by bringing in Marcelo, Morata and Jesé, but time was playing in Levante's favor and there wasn't much the Italian manager could still do from that moment onwards. We were only a few seconds away from knowing the exact amount of added time that the referee was going to allow to be played, when Real Madrid decided to remind us all that no game ends until the referee's final whistle. Jesé showed off what he can bring up to this team with his dynamism in the attack when he breached into Levante's defense in great speed and gave Varane the opportunity to quickly assist Morata. The 20-year forward controlled the ball perfectly with his right-foot, at the same time he tricked the defenders that were near him with his waist movement, just before scoring from a great finish. The Merengues knew the draw would still be a very negative result so they didn't celebrate much the goal and quickly picked up the ball to return to their half. The miraculous "remontada" was achieved already inside the very last seconds of the game and who else but Cristiano Ronaldo to lead the final charge. With 94 minutes on the clock, the Portuguese forward received a short pass from Luka Modric on the right but already inside the penalty area, and as he realized he was going to be given some space to shoot, he went for it without any second toughts. Ronaldo's shot got deflected on Juanfran before hitting the post and getting in, but it counted as any other goal and Real Madrid earned their much-wanted lead. If the 3 points deserve to be celebrated enthusiastically because of the rare circumstances on which things unfolded at the end of the game, the truth is that Real Madrid couldn't once more hide their flaws and limitations. A team that aspires at winning titles can't simply conceive conceding so many goals and rarely keep a clean sheet. The defense needs to tighten up, but that's not the only sector of the team which is in need of improving. Midfield keeps looking a bit rusty and it's clearly not linking up very well with the attack. Fortunately for the Spanish vice-champions, Carlo Ancelotti will now have two weeks of stoppage time ahead of him, which he can take to rethink his tactics and gaming processes. 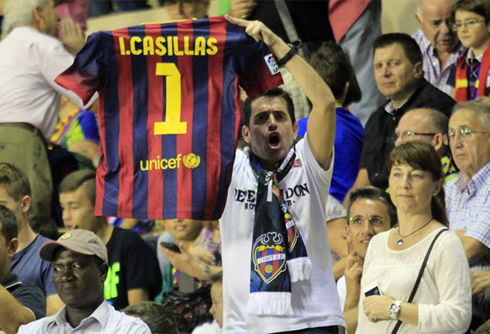 There's a Barcelona vs Real Madrid "Clasico" coming up in roughly 20 days from now and the Merengues will surely have to step up their game if they want to come out of the Camp Nou with anything near to a dignifying result. 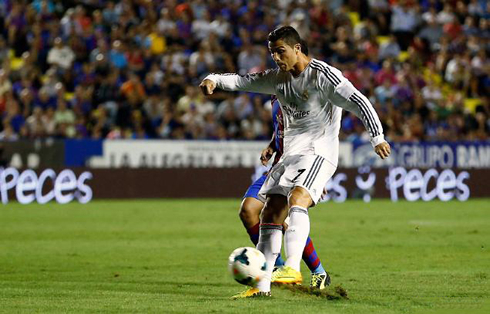 Cristiano Ronaldo next game for Real Madrid will be for La Liga against Malaga, on the 19th of October. In the meanwhile and during the WC qualifiers international break, you can watch Portugal vs Israel, Spain vs Belarus, Norwich vs Chelsea and WBA vs Arsenal, all matches provided from our sports live streaming section.